Oh yeah, we review the MSI GeForce RTX 2080 Ti LIGHTNING Z, the beast has been unleashed with highly clocked factory tweaks and a completely new look. That look entails a gorgeous RGB lighting system as well as a carbon backplate. Next, to that, the card has been over-engineered in any and all impressive ways. Manual overclocking > oc scanner. Nice looking card and nice review. Instead of led lights why dont they put some useful information in the lights. Display RPM Display clock speeds. I cannot understand why this card is tested at 1080p also. Surely anyone paying this amount of money won't be gaming at 1080p, maybe not even 1440p. I agree + it is CPU limited at that resolution. Problem is that if I do not post 1080p results, people will also complain as to why I did not post Full HD numbers. Jokes aside, it would be seriously cool to own this card paired with a 9900K to avoid bottlenecks. Yeah, forgot to mention actually that i wanted 720p resolution test! Great review as always Hilbert , thank you for a great read. This card it's aimed more towards the extreme LN2 overclocking crowd wish is a small community hence this video cards will be in short supply with a big price , nonetheless already benchmarks world records already have been broken on this video card on LN2 by my team mate Gunslinger. MSI Lightnings I like it ! For what it's worth, I can only hope that this card has comparable build quality to my trusty GTX 580 Lightning XE. I loved that card, served me well for many years. 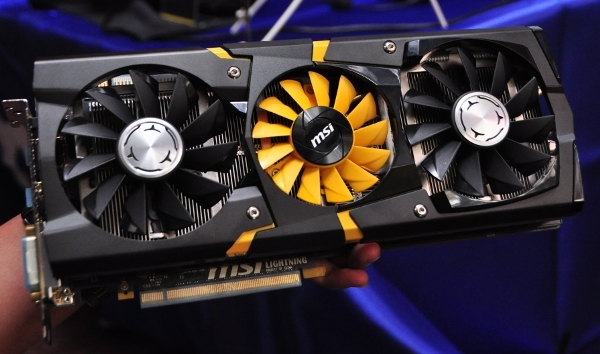 I actually still think that GTX780 and R9 290X are the best looking Lightning cards. I get where you are coming from saying this, but I don't agree. Until top end cards are able to hit 144fps or higher at 1440p reliably across the majority of current gen titles in these benchmarks, 1080p will still have a place for all those people who (like me) would like to play at high refresh rates without having to lower the graphics settings to do so. Or until the CPU bottlenecking at 1080p becomes so bad that the model bellow the top end card starts achieving basically the same results, either one of those two options really. We are getting close to 144fps across most titles at 1440p though so maybe next gen you can stop testing top end cards at 1080p? lets hope! Or until the CPU bottlenecking at 1080p becomes so bad that the model bellow the top end card starts achieving basically the same results, either on of those two options really. 1080P is still a thing. Surely people will play at any res these days I'm willing to bet most ppl do not touch setting in game. Also keep the 1080p tests for the near future Hilbert, they are still useful. 144fps at 4k I agree will take a loooong time, which is why I didn't say anything about 4k, 1440p though? we are already getting quite close with top end cards (and I have been speaking specifically about the benchmarking for top end cards). Hell just look at this review about half the benchmarks get very close to 144fps at 1440p and some get much higher, nearly all of the benchmarks at 1080p get 144fps or better on this card, so yeah 1080p is still a valid benchmark resolution for top end cards right now, but I could see the next top end card or the one after that being able to drop 1080p from its testing if things continue like this. DXR is another thing all together though, for the games that support it, yeah I can see 1080p being in the testing resolutions for a much longer time. i'm so jealous! what a great looking and performing card. the good news for the people who buy one is that MSI really knows how to put a premium product together. it really does come down to the equivalent of "nuts and bolts", which you pay for, but if i was going to buy a super-premium card i want it to feel like one. that said, as a tech enthusiast i could just look at this in a plexi display and get my jollies. but, as a RL person balancing expenditures i can't justify a card costing the price of a whole 'puter. which would be a different story if i needed it for income or if i gamed well enough to pay for a fps advantage over the 15 months before the next super-duper card. and yeah, 15 months is about right. there is going to be no extended Pascal-style life for Turing gen 1, there's a refresh right around the corner. Hilbert...... I freakin love you!!! sad i even need to put that considering today's insecurities and all.....!! With that all aside.... These cards nowadays are making it harder and harder for people like me to want to rip the board apart and slap on a waterblock! I mean.....LOOK at this beautiful thing....this....this....piece of art we have presented to us!! I'm a guy who bought two MSI Lightings 680s back in the day at launch, and there were VERY few available, so it felt like a great achievement to get my hands on 2 at the same time (for a lot of money, but compared to this, it was cheapo). This Lightning 2080Ti however... probably will never even hit the shelves here and if by chance it does, 1600-1700 euros - holy shieeee... I couldn't afford to buy even one, lol. But again, great engineering, great performance, great looks (love the gold + carbon black combo especially). PS - I still have one of those 680s as a "back-up" card :p, and even now, when I take it out it looks amazing. So yeah, from these POVs, hats down MSI, you did it again. I'd choose this over Asus for example any day. We're listing the GPU score in the shootout, not the overall performance score.